Richard Hill completed his PhD at Edinburgh University in 2006, and is now teaching English at the University of Hawaii, Maui Community College. His thesis was entitled ‘The Illustration of the Waverley Novels in Scotland: Walter Scott’s Contribution to the Nineteenth-Century Illustrated Novel’. He has written articles on Scott, Hogg, and book illustration, and is currently working on the lifetime illustrations of Robert Louis Stevenson. R. J. HILL. ‘Scott, Hogg, and the Gift-Book Editors: Authorship in the Face of Industrial Production’, Romantic Textualities: Literature and Print Culture, 1780–1840, 19 (Winter 2009). In the 1820s and 1830s, a new type of publication, designed for predominantly female middle-class audiences with leisure and money to spare, precipitated an unusual power-struggle in the field of illustrated literature. Gift-books and annuals were highly stylised, well-bound, affordable, mass-produced items of conspicuous consumption, designed as gifts for young women; their primary attractions to the purchaser lay in the proliferation of poems, stories and essays by famous authors, and increasingly on the availability of high-quality engravings. A power-struggle in the publishing arena subsequently materialised owing to various elements of production practices and technological developments that challenged traditional modes of book production. Lower production costs and the ability to mass-produce texts, thanks to the inventions in the early 1800s of stereotyping, the Fourdrinier paper-making machine and the power-press, drove down the cost of books for the middle-class consumer. In addition, the development in London of steel-plate engraving—which allowed for thousands more prints from a single plate than copperplate engraving—meant that publishers in this field could look to produce publications at a greater rate than artists and writers could supply material. The engravings began to dictate production practices, as it became clearer to gift-book editors that it was the illustrations that were driving demand and effecting profit. Authors had traditionally viewed themselves as the primary source of literary production, but were now being asked to ‘illustrate’ images that had been pre-commissioned by editors, leading inevitably to a tension between author and gift-book editor. As this paper will argue, the rise of the gift-book in the late 1820s precipitated a fundamental shift in the role of the author in the production of popular literature, particularly with regard to illustrated fiction. This phenomenon can be exemplified by a comparison between contributions made to the gift-books by Sir Walter Scott and his friend James Hogg. Scott’s willingness to participate in this highly visual and consumer-driven trade was at odds with some of his ‘higher-minded’ contemporaries’. As Laura Mandell has argued, the gift-books were largely responsible in the 1820s for creating a bourgeois aesthetic that competed with and countered the pre-existing dominance of canonical Romantic poetry, represented most assertively by Byron and Scott himself. However, just as Scott bowed to the inevitable in acknowledging Byron’s superior marketability in poetry by turning to the novel, so he bowed to the inevitable shift in public taste towards the commodification of literature through the gift-books. Consequently, he earned substantial cash, while achieving increased public exposure at a time following the 1826 financial crash when he most needed it. Hogg, by contrast, was initially delighted to have found a reliable source of income, which simultaneously satisfied his desire to experiment with genre and authorial voice. At a time when Hogg, like Scott, was struggling financially, the gift-books offered remuneration at a competitive and regular rate, particularly given the abundance of titles that Ackermann’s Forget Me Not triggered. Writing to Ackermann in 1827, Hogg says that ‘I am a poor man and never pretend to write for nothing, as I cannot afford it; but I leave always the equivalent to the pleasure of the publishers of the periodical works, whom I have never found ungratefull [sic] if my name and contributions proved of advantage to them’. Hogg’s attitude to the gift-book culture, therefore, was one of a professional writer grateful for work. As time progressed, however, editors would take greater liberties with such authors, and the illustrations to these works would become an increasingly restrictive element to their creative licence. Lockhart’s antipathy seems to be projected towards the gift-books’ heavily illustrated (painted) presentation; however, his vitriol towards the gift-book genre here was personally motivated (as was often the case), and a little disingenuous. An anonymous article in The Bookseller of 1858, entitled ‘The Annuals of Former Days’, reveals that Lockhart himself not only failed in a bid to establish his own literary gift-book, but that his failure was partly owing to his open aversion to illustration: ‘One of the most bitter revilers of annual publications was the late John Gibson Lockhart. He had made an unsuccessful attempt to establish one himself, which should depend for its success altogether on its literary merits; for it was coarsely printed, and professed to exclude engravings, upon principle’. Lockhart had successfully and anonymously contributed another illustrated piece to The Literary Souvenir, entitled ‘Epistle from Abbotsford’, a romanticised and highly visual tour of the deceased Scott’s home (a preamble to the hagiographic Life), and was therefore very familiar with the gift-books’ reliance on illustration. However, Lockhart’s inability to swallow his considerable pride and ‘buy into’ the visual nature of the gift-books foiled his project for one of ‘literary merits’, signifying a shift away from the author within the publishing hierarchy; by contrast, Scott’s willingness to engage with the media of popular mass-culture (and to swallow his pride) made him a much more attractive and lucrative prospect for editors, particularly given the weight his name would add to their publication. This strategy of sending old or sub-standard material for quick rewards was a way for Scott to maintain a relationship with the various editors of the keepsakes without muddying his hands too much in the mechanics of popular printing and publishing. It also allowed him to maintain a profile with precisely the audience that he and Robert Cadell were targeting with the Magnum, a publication that closely followed the physical format and production practices established by the gift-books. Cooper would produce some of the first illustrations for the Magnum in 1829, providing continuity in the public consciousness between the gift-books and Scott’s new anthology. Scott’s interactions with the gift-book editors signal a changing relationship between author and publisher: the author is being asked to produce work at a greater frequency, to deadlines, for smaller rewards, for mass-proliferation, in works that were essentially often incoherent collections of literary and artistic paraphernalia. 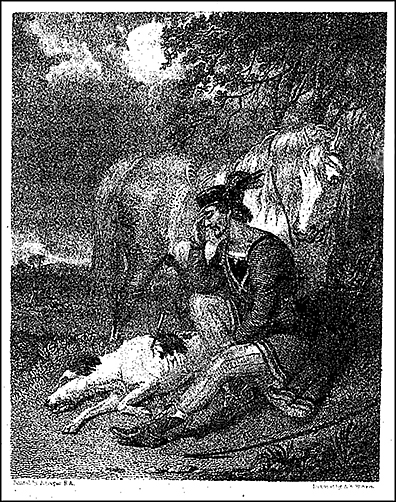 Owing to the emphasis placed on the illustration and engraving processes, the costs of which far exceeded the cost of an author’s contribution, even Scott became subject to the public consumption of popular illustrated literature. In resistance to this power-shift, Scott refused to commit new or original work: instead, he was happy to send the editors old cast-offs and second-rate pieces, which had the useful effect of maintaining a profile in the gift-book culture at little inconvenience to himself, in order to promote more pressing publishing concerns. The Magnum Opus, therefore, bears the traces of the gift-books’ highly ‘painted’ presentation, while Scott simultaneously distanced himself publicly from the ‘vulgar’ mass-production of illustrated literature. This communication speaks volumes about the importance that gift-book editors were placing on the engravings. The engravings are no longer merely illustrations; it is Hogg who is asked to provide the ‘illustration’. Pringle does not even deem it necessary to provide Hogg with the actual image from which to work (a slight Scott never suffered with this genre). Instead, Pringle has a clear idea in his head of the type of work he wants from Hogg: ‘but give me some of the glorious romance of your own boyhood when the spirit of poetry & romance first began to pour over you the visions of fairyland which afterwards found expression in the immortal “Kilmeny”, & others of your loftiest Lays’. This is an example of an editor—in this case Hogg’s friend—attempting to solicit a certain type of contribution to fit his gift-book, and more precisely to fit a pre-commissioned illustration. As Currie has pointed out, Hogg was much more open to the opportunities that the gift-books presented to professional authors than many of his contemporaries. The variety of gift-books and their audiences opened diverse channels for his multifarious narrative modes, but he still managed to push the boundaries of censorship and audience sensibility. Hogg’s irritation at editorial attempts to censor his work is displayed in his ability to subvert the images that were sent to him. A good example of this is a story published in the Forget Me Not of 1834 called ‘The Scottish Haymakers’, in which Hogg demonstrates how authorial resistance to editorial control while writing for an illustration resulted in something innovative. As Gillian Hughes has pointed out, the editor Frederic Shoberl must have sent a proof of the plate to Hogg from which to write. Unfortunately, the letter has not survived, although we can deduce from Hogg’s prickly reaction a year later that Shoberl did not deem it necessary to provide him with any kind of context for the image: ‘You have a confounded way of sending me a picture without either telling me who is the artist or what is the story and I am not very acute at these things. I do not know what is represented by the print’. Again, it becomes clear that the editor is placing the emphasis on image over text: the writer becomes the illustrator. Hogg’s response to this image is ingenious. Rather than frame his narrative around the central foreground lovers, his story takes its cue from the hay cart in the background, and the figures that surround it. Hogg leads the reader off with the hay cart into a disturbing story of madness, as a ventriloquist Mr Alexandre drives the owner of the hay cart insane by mimicking a crying child, while the lovers are only briefly referenced in the broadest possible generic terms. ‘The Scottish Haymakers’ becomes a story about the instability of pictorial recreation of pastoral scenes—more to the point, Hogg demonstrates a resistance to editorial control in a way which did not necessitate censorship. He felt similarly disgruntled at censorship from Anna Maria Hall, editor of the Juvenile Forget Me Not, wife of Samuel Carter Hall, editor of another staple gift-book, the Amulet. He writes to Mrs Hall, ‘I sent you a very good tale and one of those with which I delight to harrow up the little souls of my own family I say it is a very good tale and exactly fit for children and no body else’. This poem was most likely published in her husband’s Amulet for 1836, making the point that such raw material from a famous author, who had died in 1835, was too lucrative to waste for the gift-book editors. This letter also demonstrates the tight censorial control editors held over authors who were struggling to survive in a competitive marketplace. Despite his protestations, Hogg still provided Mrs Hall with another alternative, while simultaneously offering the original story to a more suitable publication. It is the illustrated contributions, however, that offer the clearest picture of the reduced status of the author in the gift-book industry. Scott, owing to his pre-existing status as a country gentleman with pretensions to aristocracy, and as a literary superstar challenged only by Byron, was to some extent able to resist the demeaning effects of industrial book-production as represented by the gift-books, but even he was forced to interact with the ‘toyshop of literature’. Scott could afford to be belligerent with editors like Heath, while turning down the advances of Allan Cunningham for contributions to The Anniversary. He could afford to send work he considered second-rate to editors he had to keep interested, in the knowledge that his work would be illustrated. This threat of illustration produced its own anxieties for an author who took as much control over the physical production and representation of his work as possible, but while he was recruiting artists and engravers for the Magnum, it was a risk he was willing to take. Hogg, meanwhile, was initially happy to engage in a medium which offered him regular work with a varied range. His work, by contrast with Scott, was used more typically as illustrative of the images that were sent to him. However, both writers demonstrate a resistance to editorial efforts to control their literary output: the keepsakes and gift-books were attempting to propound a certain consumable type of literature—poetry and prose which could be appreciated by the widest possible audience, and therefore the narrowest possible sensibilities. Scott, and particularly Hogg, found themselves fighting against this trend of generic literary production, albeit in very different ways. Nonetheless, what becomes clear through the production of the gift-books is that the relative status of the author in the production of popular literature was compromised by innovated production practices and increased public demand for affordable illustrated fiction. 1. For a recent discussion on the gift-books as objects of consumption and definition for women, see Katherine D. Harris, ‘Feminizing the Textual Body: Female Readers Consuming the Literary Annual’, Papers of the Bibliographical Society of America, 99.4 (Dec 2005), 573–622. 2. Lee Erickson, The Economy of Literary Form: English Literature and the Industrialization of Publishing, 1800–1850 (Baltimore: Johns Hopkins University Press, 1996), p. 19. 3. Walter Scott, ‘My Aunt Margaret’s Mirror’, from Short Stories by Sir Walter Scott, edited by Lord David Cecil (Oxford: OUP, 1934), p. 260. 4. Laura Mandell, ‘Hemans and the Gift-Book Aesthetic’, Cardiff Corvey: Reading the Romantic Text, 6 (2001). Online: Internet (31 March 2005): <http://www.cf.ac.uk/encap/corvey/articles/cc06_n01.html>. 5. Gillian Hughes (ed. ), The Collected Letters of James Hogg, 3 vols (Edinburgh: EUP, 2004–08), II, 260 (1 Apr 1827). 6. W. E. K. Anderson (ed. ), The Journal of Sir Walter Scott (Edinburgh: Canongate Classics, 1998), pp. 473–74. 8. J. G. Lockhart, The Life of Sir Walter Scott, Bart. (Edinburgh: Adam & Charles Black, 1871),p. 686. 9. ‘The Annuals of Former Days’, The Bookseller, 29 (1858), 494. 10. Scott, Journal, p. 473. 13. H. J. C. Grierson (ed. ), The Letters of Sir Walter Scott: Centenary Edition, 12 vols (London: Constable & Co. Ltd., 1932–37), X, 457. 14. Janette Currie, ‘Introduction’ to James Hogg, Contributions to Annuals and Gift-Books, edited by Janette Currie and Gillian Hughes (Edinburgh: EUP, 2006), p. xxi. 15. Hogg, Collected Letters, II, 318 (27 Nov 1828). 16. Erickson, Economy of Literary Form, p.29. 17. Richard Hill, ‘Writing for Pictures: The Illustrated Gift-Book Contributions of Scott and Hogg’, Studies in Hogg and His World, 18 (2007), 5–16. 18. Hogg, Contributions to Annuals and Gift-Books, p. 313. 20. Janette Currie, ‘Introduction’ to Hogg, Contributions to Annuals and Gift-Books, p. xxi. 21. Hogg, Contributions to Annuals and Gift-Books, p. 302. 22. My gratitude to Gillian Hughes for access to this letter. 23. Hogg, Contributions to Annuals and Gift-Books, p. 78. See my ‘Writing for Pictures’ for a detailed discussion of this image and its corresponding textual response. 25. 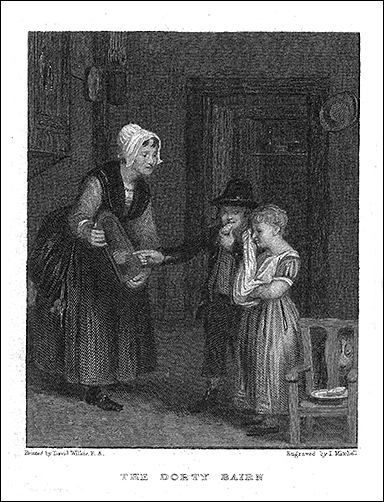 For reproductions of all the stories associated with this image and extensive bibliographical detail of the stories, see Gillian Hughes’ notes to The Dorty Bairn and Hogg’s triptych of ‘The Dorty Wean’, ‘The Auld Naig’, and ‘David Wilkie’ in Contributions to Annuals and Gift-Books, pp. 181–85 and 325–30. 26. Hogg, Collected Letters, II, 371 (19 Jan 1830). 27. Ibid., II, 383 (22 May 1830). 28. In a letter of 16 Apr 1828, Scott excuses himself from committing to Cunningham’s gift-book, as he has eschewed all such offers except ‘in one case Mr Heaths’ (Letters, X, 411–12).